Do I need probiotics? Oh YES, and here is why. Probiotics are live microorganisms (aka as good bacteria) helping us maintain healthy intestinal flora. Microbiologists have increasingly established how important to human health can good bacteria be. Even the word “probiotic” means “FOR LIFE”, being derived from the Greek words: “pro” – signifying promotion, and “biotic” which means “life”. Our body is a host to good (friendly) and bad bacteria, and is constantly striving to maintain optimal balance. Probiotics play an essential role as they let us tip the balance by introducing friendly bacteria into our digestive tract. Keeping our intestinal flora healthy makes keeping bad bacteria and toxins out of the system easier, and one way to ensure we have enough of these friendly guys in our gut is by eating probiotic rich foods or taking a good probiotic supplement. I remember as a kid growing up, anytime I needed to take antibiotics (by the way, antibiotics wipe out the good bacteria along with the harmful ones), my doctor would tell me to make sure I drink plenty of plain kefir (aka liquid yogurt). While plain kefir is a staple in the Mediterranean region where I grew up, and is pretty much consumed on a daily basis, the reason for consuming more yogurt while taking antibiotics was because of the healthy bacteria abundant in this cultured drink that helped replenish beneficial bacteria in my gut, therefore strengthening my immune system. You too have probably heard that probiotics are most regularly attributed to yogurt and cultured cheeses. But what about for those of us not keen on dairy products? (I happened to ditch dairy several years ago). 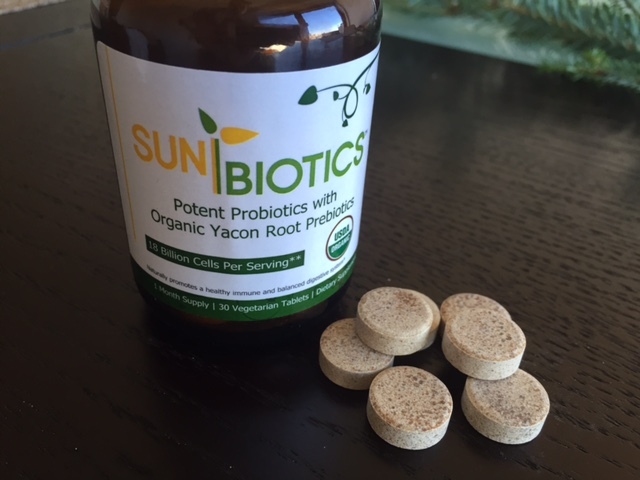 Thankfully, probiotics are also found in products that are 100% plant-based. Some great options are kimchi, sauerkraut, tempeh, miso and kombucha. And when these aren’t readily available, especially when we are traveling, having a good probiotic supplement comes in handy. I recently came across a supplements brand called SunBiotics, and love them. 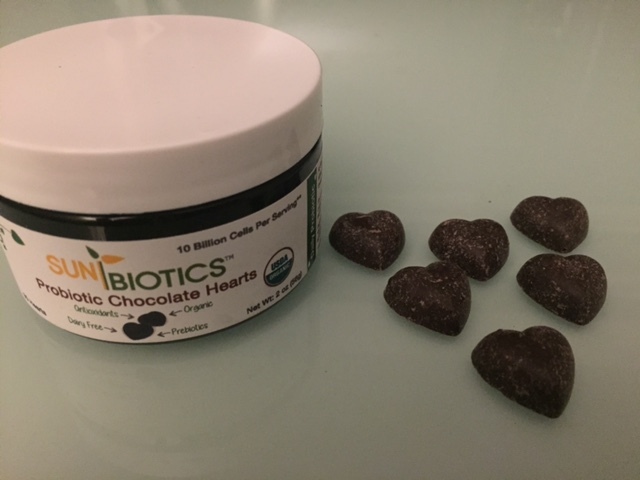 Their products are dairy free, raw, organic and gluten free, and come in many different forms, making it easy to ensure that we are getting in our daily probiotic dosage. My personal favorite are the tablets as they are most potent and most convenient to carry with me when traveling. Their statement for this product is that at 18 billion CFUs per serving, Sunbiotics™ may help restore a proper balance of flora in the digestive system depleted by stress, antibiotics, and gastrointestinal disturbances. 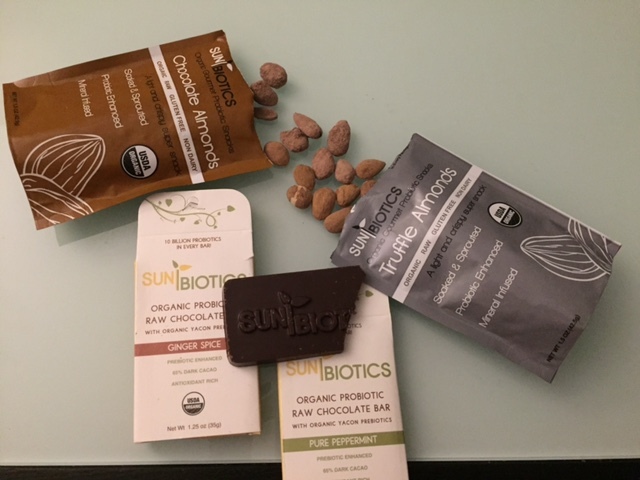 This company also makes probiotics available in chocolate bars as well as almond snacks! YES, they make decadent chocolate bars enhanced with probiotics — talk about a treat that YOU and your belly can feel good about! And it is not just a chocolate bar, their chocolates are raw, unprocessed, organic and all around chocolate decadence. They sure have found a way to ensure we keep our intestinal flora in check. You want to know what else are probiotics good for? Besides keeping the immune system high, proper levels of good bacteria also promote glowing skin, healthy weight, and an overall optimal health.